everything was great with the exception of not enough cooking supplies for 8 people. Fry pan too small, need wash cloths and something electrical is wrong in the washer/dryer room. keep throwing the breaker which lead to no lights in pool area till breaker was reset. Overall, property is WONDERFUL and stay was AMAZING. We will be staying here again in the future. Amazing property! Spacious, safe, easy to get to and close to the beach. Everything was an easy drive. The hosts were amazing and so accommodating. I highly recommend. Access to the property, mini market nearby, near palm beach (high rise area), washer and dryer, kids loved the pool. Everything was a short drive away. The house was clean and stocked with everything we needed for the stay. The owners and staff are responsive and friendly. The pool was clean and was maintained during the stay. The property is safe and private. Lots of sitting room in and out. BBQ grill was clean and ready for use. Too much to describe. It was just a great experience. Everyone was very nice, timely, and professional. Everything was as advertised. The hosts were super friendly and the Villas were huge, really loved the space, the aircon, and the outdoor poor area with barbecue facilities. Excellent comfy beds and a superb shaded poolside terrace. Overall we were very pleased with the quality of this villa and the helpfulness of Frank and his staff, so we would highly recommend Merlot Villas. We liked everything about this resort. Very nice, very clean. Stayed here for 9 nights. Amazing property. Pool was amazing after being in the aruba sun all day. Highly reccomend. Lock in a great price for Merlot Villas Aruba – rated 9.3 by recent guests! Merlot Villas Aruba is an exclusive gated villa community at 10 minutes’ walk from Palm Beach. 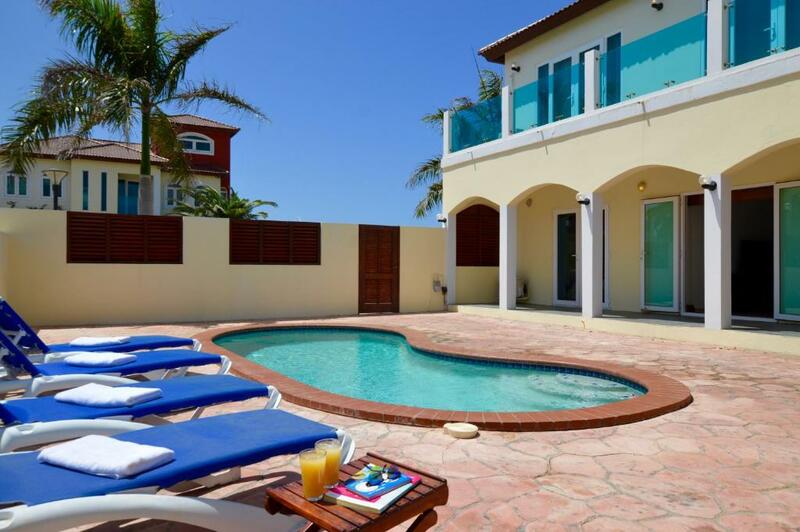 Each villa at Merlot Villas Aruba has it's own private pool, terrace with lounge chairs, dining set, BBQ and roof terrace offering beautiful sunset views. All private villas feature 4 bedrooms with private bathrooms and can accommodate up to 8 or 10 people. The villas are fully air-conditioned and have a modern interior with separate dining room and fully equipped kitchen. There is free wireless Internet, Satellite TV and washing facilities on the property of the villa. Merlot Villas is a 15 minutes' walk from the High Rise Area, with it's shopping and dining. The villa is 1.9 mi from Tierra del Sol Golf Course. When would you like to stay at Merlot Villas Aruba? This spacious Four-Bedroom Villa with Private Pool features free WiFi connection, washing facilities, a modern interior, and air-conditioning. The private garden with pool offers a terrace with lounge chairs, dining set and BBQ. The villa comes with a fully equipped kitchen with 4-pit stove, microwave, coffee maker, double door fridge, dishwasher, kitchenware and a separate dining room. There is a living room and separate TV room with flat-screen satellite TV. The master bedroom with private bathroom features a TV, walk-in closet and open balcony. The three additional bedrooms have there own bathroom with spacious shower cabin, grand mirrors and sink. One of the bedrooms is located on the ground floor, the other first floor bedrooms have access to the terrace which offers beautiful panoramic views. This spacious Deluxe Four-Bedroom Villa with Private Pool features free WiFi connection, washing facilities, a modern interior, and air-conditioning. The spacious private garden with swimming pool offers a shaded furnished terrace, lounge chairs, a dining set and BBQ. The villa comes with a fully equipped kitchen with 4-pit stove, microwave, coffee maker, double door fridge, dishwasher, kitchenware and a separate dining room. There is a living room and separate TV room with flat-screen satellite TV. Merlot Villas Aruba is a small exclusive villa community located only 750 yards from Palm Beach, one of the world’s most beautiful beaches. Merlot Villas offers spacious fully equipped villas, all with their own private pool & BBQ. Our team looks forward welcoming you at Merlot Villas on the beautiful island of Aruba. We will make sure you enjoy your time with us and are there to answer any questions you might have before or during your stay. Merlot Villas is a safely gated community located in the Palm Beach area at only 750 yards from the beach and High Rise Area. The High Rise Area is where you will find all the restaurants, bars, shops and other activities. For your convenience there is a mini-market just around the corner within 1 minute walk. House Rules Merlot Villas Aruba takes special requests – add in the next step! Free! Any additional children under 2 years stay free of charge when using existing beds. Merlot Villas Aruba accepts these cards and reserves the right to temporarily hold an amount prior to arrival. the pool had a slow leakage problem and was losing water, but staff attended to this problem and cleaned and refilled the pool every 3 or 4 days so it did not affect our enjoyment at all. The are has a lot of potential if maintained a bit more. Maybe change the pillows as they were a bit uncomfortable. Some Amenities need an upgrade.